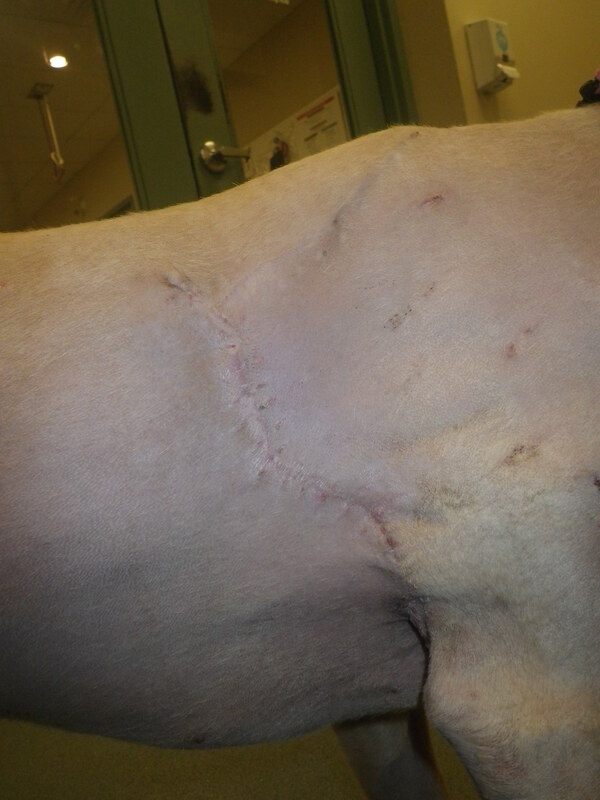 Palm was at our hospital yesterday to get her sutures removed from the 2nd surgery. We are happy to report that the surgery was successful. The key to success in such wounds is to go back to surgery when the underlying tissues are not infected. This is problematic when the skin is not intact (the wound is open) which predisposes to infection even when precautions such as clipping hair (see her haircut! ), disinfecting solutions, wearing gloves during bandage changes are used. This is compounded by the fact that reliance on antibiotics eventually leads to more resistant bacteria which in turn become more difficult to treat. The antibiotics get progressively more expensive and have more side effects. The use of honey bandages allows us to make the wound environment less hospitable to bacteria without relying solely on antibiotics. If the patient is not ill, we may even forego antibiotics all together until the wound can be closed which is what we did in Palm’s case. Dr Schiller performed the second surgery and was quite pleased with the results yesterday. The wound seems completely healed and Palm was her bright self again. She is walking a bit stiffly with her right foreleg and will need some rehabilitation therapy to regain the full range of motion in that leg. The stiffness is suspected to be related to the cumbersome chest bandages she required for weeks, her primary injury and the associated scar tissue. We expect she will make a full recovery but like all major trauma patients, this usually takes several months. The recovery from severe trauma or critical illnesses is a long process. This emotional roller coaster often takes toll on the family of the loved ones (this is true whether the loved one is furry or human) and often lasts for several months. In Palm’s case, there was such an outpouring of caring and support from the community, this undoubtedly made it easier for her family. We do not expect that she will require further care from the ICU or surgery teams in her next visits. We will keep posting pictures and videos of her on our facebook page when she comes for her rehabiliation therapy visits. We look forward to her tail wags!